Jan Oliver Wagner, CEO of Greenbone and OpenVAS Community leader sent recently several messages to community email list with the great news. First of all, Greenbone decided to drop two weeks delay in a free plugin feed, that was implemented in June 2017 and made some OpenVAS users pretty nervous. I wrote about it in “GSM Community Edition and lagging OpenVAS Plugin Feed“. The good thing is that, it has increased interest in NASL scripting among OpenVAS users. I also made some steps in this way in “Adding third party nasl plugins to OpenVAS“. I don’t now why Greenbone finally decided to drop this delay, but I am very glad for this decision. Wise move! The feed will stay delayed until September 4th, 2017. To demonstrate the current state I used some data from Vulners.com collections. Let’s see the nasl vulnerability detection plugins for CentOS in Nessus and OpenVAS. I know that Windows would be much more clear, but Microsoft released latest MS17-023 bulletin in March, so now there is no much difference there. 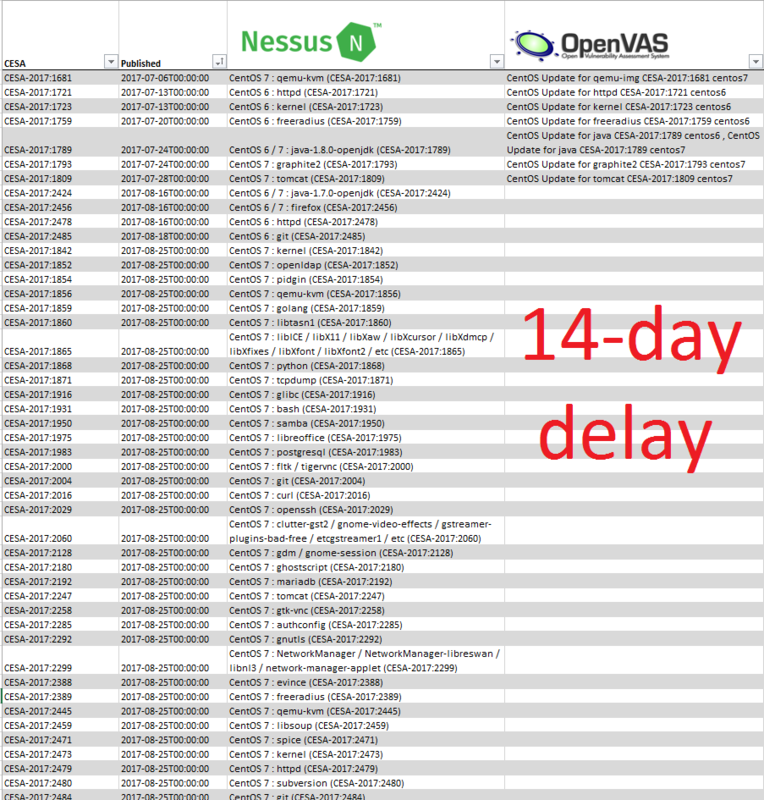 As you can see, no OpenVAS plugins since 2017-08-16, literally two weeks. And I hope this will change very soon. Don’t forget that NVT will be called now GCF (Greenbone Community Feed) and some advanced enterprise-level checks will be now released only in paid feed. Another good news is the recent release of open source GVM-Tools for controlling OpenVAS remotelly. It will replace old console client openvas-cli (omp). Let’s try to download and install it on Debian host with installed OpenVAS (see “Installing OpenVAS 9 from the sources“). This entry was posted in Vulnerability Management and tagged CentOS, Debian, GCF, Greenbone, GVM-Tools, NASL, Nessus, OpenVAS, python, vulners.com on September 1, 2017 by Alexander Leonov.